You are here: Home / Hiring a Pet Sitter / Should I Bring My Dog With Me on Vacation? Trying to decide whether or not to bring your dog with you on vacation? You may be tempted to bring your pooch along with you on vacation, but here’s the thing. If you are planning on going out and exploring the town, as you would probably do on your vacation, keeping your dog cooped up in a hotel room all day long can cause undue stress for your pup. But kennels are expensive, and just as stressful. You certainly can’t leave your dog alone, but her own environment would be the best option. Somewhere she’s sure to be comfortable. If you do decide to take your pet with you, here an article on “How To Ensure Your Pet Has A Happy Vacation“. When looking for the right dog sitter, do your research. Will she be able to provide your dog the care she needs? Can she cater to any special needs your dog has? Does her schedule cooperate with your dogs’? Is she reliable and trustworthy? Local? Sure, you could enlist your neighbors, friends, and family to care for your dog while you’re away. They could provide her with all the basics, taking shifts. But this method is a little chaotic and could cause stress for both you and your dog. Finding a sitter should be a priority. Ask around for recommendations from people you trust. Check online, and be sure to read reviews. Inquire about her experience, training, and qualifications. Check that she has a backup in case she becomes ill or has car trouble. Make sure she is specific about fees, and provides a written statement that spells everything out. Speak with your sitter one-on-one about your pet’s needs, and definitely take her contact information, so you can stay in touch while you are away. Make sure the temperature of your home is comfortable for your pet. The sitter will be able to monitor this for you. Put away anything that your doggy might get into while you are away. Leave a list of contact information, including your vet’s number for the sitter. You will also want to leave your sitter with lots of information about your pet’s daily routine. Talk to her beforehand, but also leave a detailed note that she can refer to. To make sure your dog is completely comfortable, make sure everything stays consistent: the same meal times, treat times, walking habits, etc. 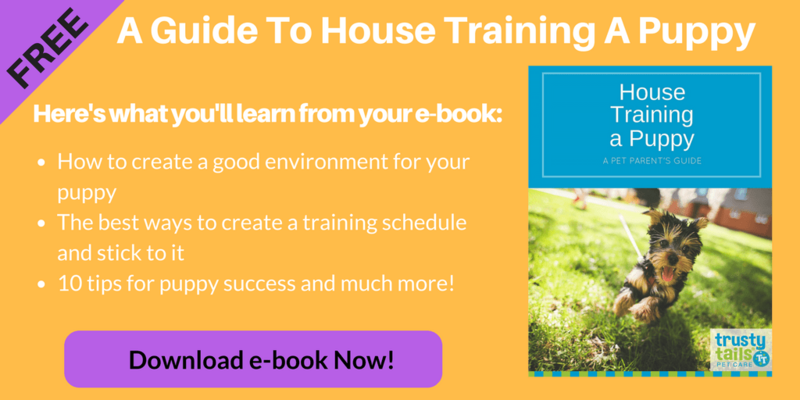 Download Our Free Checklist On How To Prepare For A Pet Sitter. Leaving your dog at home while you are on vacation may seem daunting, but in the long run, you will thank yourself for taking the time and care to ensure both your own peace of mind, and your dog’s comfort. Here at Trusty Tails, we do all the hard work for you which in turn will leave you guilt free and ready to enjoy your vacation. Your dog will have so much fun, he will feel like he’s on his very own vacation! Have Questions About Hiring A Pet Sitter? Give us a ring at 201.466.1559 or contact us on our website today.